These may be stored in the refridgerator or used immediately. Tips + tricks: Have left over crepes? Have left over left-overs? Try "come-back-tomorrows". Wrap your left-overs in a crepe of a new, tasty meal! This crepe is a little less eggy (and with just a bit more flour by proportion) than our other crepe recipe. 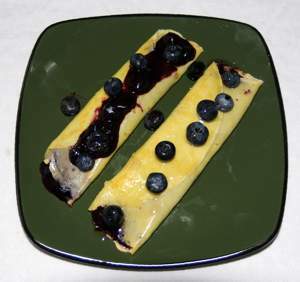 This one was the way my grandmother made them for Cheese Blintzes (also known as Blintze blintz, blin; plurals blintzes, blini, blinchiki, blynai and others). Of course, there is the most famous of the crepe dishes, the "crépes Suzette" is a delightful crepe, fired in alcohol ... based on orange - usually containing some Grand Marnier and a bit of orange zest. Prefer a basic pancake? Click Here.